This famous verse begins with rejoicing. For this series, I’m going to start with the second part. The weeping. We’ve got that weeping part down, don’t we? We know how to weep. We know what it’s like to ugly cry in the bathroom when there is another negative test on the counter. We know how to curl up in a ball in bed and sob like we’re pros. We know what it’s like to have tears sting our eyes when we see a dozen pregnant women every time we step foot out of the house. We know the tears that fall when we see another pregnancy announcement on Facebook the day our period starts. That kind of pain is hard to put into words. It’s one of those things you probably can’t understand until you’ve been through it. But it’s the kind of pain that makes us strong for others. It’s the kind of pain that allows us to have a deep empathy, not just sympathy, with others who are similarly struggling. The kind of pain that causes our hearts to ache when we hear of a friend (or even a stranger!) who is going through the same thing. The kind of pain that causes our own tears to fall as we hold our sobbing friend. The kind of pain that can truly tell our friends, “It will be ok” and mean it. Our pain allows us to minister to others in ways that we were not previously able to. It is so important to be vulnerable and willing to be that shoulder to cry on. For some people that will mean telling close friends and family. For some it might mean blogging. For others it might mean starting an infertility support group at your church or in your community. As Christians, we have a hope and a joy that the world needs to hear. And we in turn need to have shoulders to cry on. By sharing our experiences with others, we can mutually encourage each other by crying or talking or laughing together. So go weep, friend. Weep your heart out. It is ok to weep. 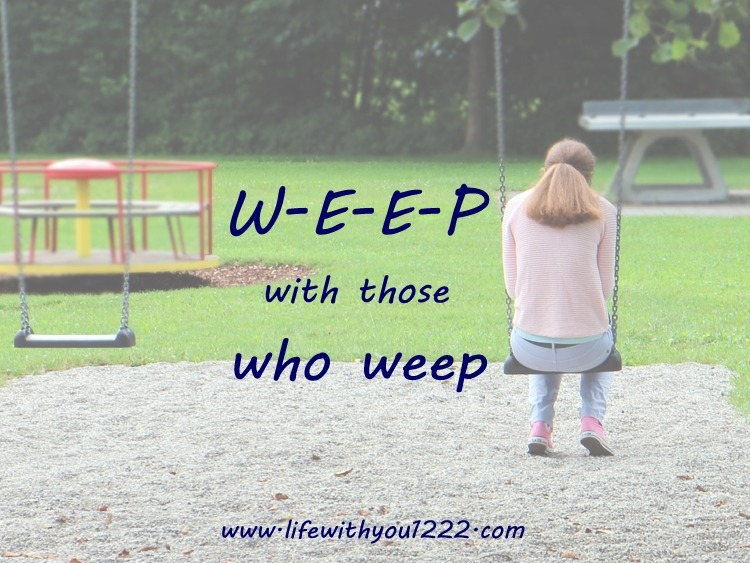 God will bring people to you who will also need you to weep with them. Embrace it.